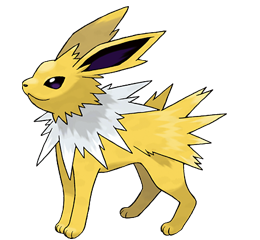 Jolteon is the second of three possible Generation I Eeveelutions (nowadays there are like 79 of them), but it is far and away the best of the trio. It's also the favorite Pokemon of Will Pacarro, aka Yellow Paco, aka the fan favorite on Internet Icon Season 2. And that's gotta count for something. Plus it's friggin' adorable. Just look at that poonum! Finally, its Japanese name is "Thunders," which is very cute. Even with subpar HP, Attack and Defense, Jolteon excels in Special, and is one fast lil dog/fox/whatever the hell it actually is. Outside of Electrode, it's the second fastest Poke in the game (tied with Mewtwo and Aerodactyl). Not too shabby. It's also only weak against Ground types. One weakness? Sign me up! Thunderbolt. It's way more accurate than Thunder, and the slight decrease in power isn't enough of a deterrent to shy away. Just whatever you do, don't use Thundershock. Ew. Thunder Wave. Jolteon is already going to be faster than just about you face, so in this case, you're using the move almost exclusively for the paralysis. But hey, if my opponent has a 30% chance of not attacking and I have a 0% chance of not attacking, those are QUALITY ODDS. Reflect. Jolteon's Defense is one of its lesser skills, so being able to up that stat is a good thing. You won't ever be the top of the class in D, but at least you won't be James Harden level of bad. The last move is up to you. Double Team is always enjoyable with Thunder Wave because it'll frustrate your opponent to no end. Toxic, which has become pretty terrible in the modern days, is another option for annoying your opponent. Being poisoned and potentially not able to attack is a...well, an annoying combo. The only physical attack I'd put on Jolteon is Body Slam--HP is too fragile to take recoil damage back from Double-Edge or Take Down, and Hyper Beam's two-turn M.O. just leaves you open to an unnecessary extra hit. Why anyone would want to hit this adorable afghan-wearing Afghan Hound is beyond me.